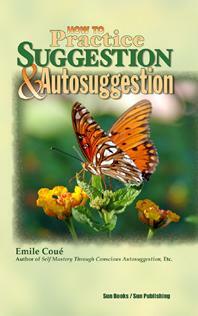 How to Practice Suggestion and Autosuggestion by Emile Cou�, Preface by Charles Baudouin. Interviews of Patients, Examples of the Power of Suggestion and Autosuggestion, Suggestions: General and Special, Special Suggestions for Each Ailment, Advice to Patients, Lectures Delivered by Emile Cou� in America. 128 pgs. 5x8. Pbk. ISBN: 0-89540-197-5. $15.00.